The Owensboro Humane Society believes that all mankind is collectively responsible for the care and respectful stewardship of the earth and all its creatures. In pursuit of its vision, the Society strives to improve the life, health, and habitat for rejected, abused, and neglected animals in our Owensboro area. 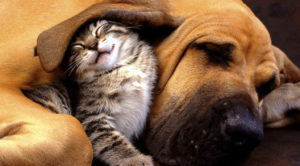 We seek to connect adoptable animals with well-matched forever homes for the adoptable and to provide a safe, nurturing, no-kill sanctuary of last resort when that is not possible. 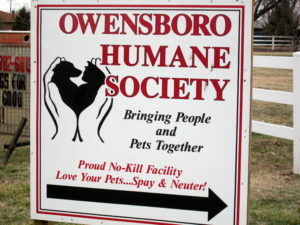 Since 1968, the Owensboro Humane Society (OHS), a 501(c)(3) charity, has slowly grown in strength and numbers to stop abuse, neglect and the over breeding of our local animal population. The Owensboro Humane Society believes that all animals are adoptable and that is why in 1999, we decided to go completely NO KILL (mercy kill’s only – beyond any medical help). Like people, some of our animals have special needs, or just may be senior citizens – but they are all adoptable. Our staff and volunteers make OHS a home for our animals until a new family arrives to adopt them. None of our animals are killed for room or because they aren’t as “adoptable”. Some will spend their remaining lives in our care. Even though we are small in size, we are big at heart. Our size and fund restrictions limit the number of animals we can rescue; however, we are dedicated to help as many animals as possible.